The BioPulser® has been designed to permit the drumming of muscles so they vibrate at their natural resonant frequencies thus producing a moderate stimulation which soothes them to relax while simultaneously avoiding over-stimulation which would excite them to contract. 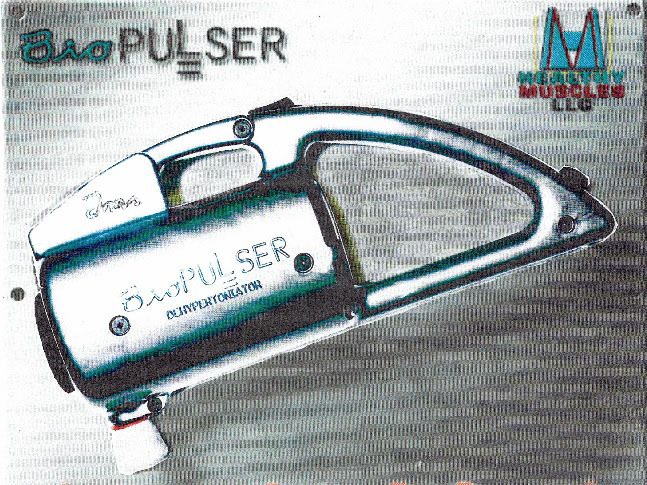 The BioPulser® was made to be the major component of K.A.N.O.N. hypertonic muscle correction protocol but can also be used alone as a "first-aid" device. As a complement to the BioPulser®, the compatible finger-tip "surfing" (manipulation of the muscle surface layers only) technique also stimulates without exciting the muscles. This moderate rocking stroke is described in "What's Really Wrong With You?" p 146. Functional organization of muscles beyond the visual gross anatomical organization. How to position the relaxed body such that the treated muscle is near its shortest length – i.e. its most passive state. Keeping the solution from becoming part of the problem. Muscle vibration and light fingertip muscle surfing. The Biopulser "drums" the muscles into their resonant vibration.